Ubisoft broke with tradition earlier today by announcing that its first substantial Assassin's Creed III downloadable content won't be an extension of the main game's story. Rather, it'll be an exploration of what would happen if George Washington hadn't done one of the most extraordinary things in human history and given up his vast powers at the end of the Revolutionary War. It sounds crazy. 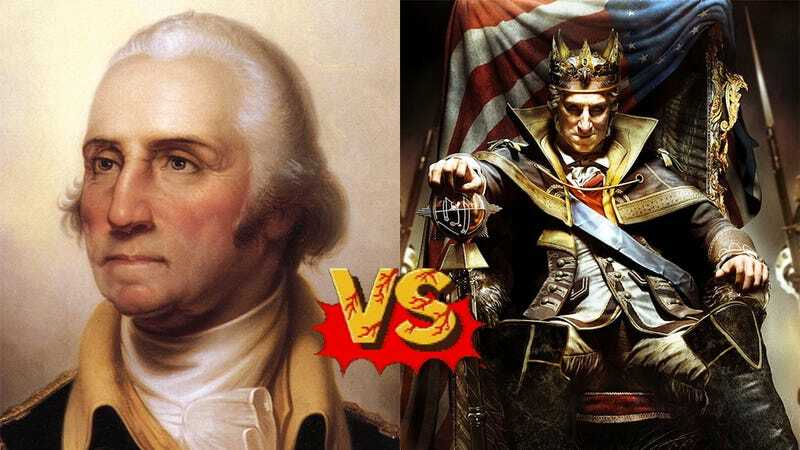 Maybe even blasphemous to staunch American patriots, who have long held up Washington as some kind of perfect man, the ultimate union of military commander and civic leader. But then, to crazy people, it doesn't sound crazy at all. Because they've been saying Washington was fishy for years. While historical record has it that Washington led American forces to victory in America's War of Independence, and then became the newly-created United States' first President, there's long been a fascinating and at times hilarious belief held by some that he was mixed up in all kinds of shady dealings. How can one of the most respected and well-regarded men in not just American but all of modern history possibly be suspected of being a bad guy? Even by nutcases? Easy. Because he was a Mason. Cue the tinfoil hat brigade. Initiated into the order in 1752, Washington was one of the most prominent members of the society for the remainder of his life, to the point where upon retiring from public office he was named a Master in the Virginia charter of Alexandria Lodge No. 22. (where he's still listed as their Charter Master). Because Washington and many other prominent founding fathers, such as Benjamin Franklin, were all members of the order, various conspiracy theories have arisen over the years—fuelled by the theorised presence of Masonic symbols on things like US dollar bills—all suggesting that, behind the scenes, these guys were up to no good. It's a vague conspiracy, and not even a very entertaining one, because aside from the fact he really was a Mason, there's not much to suggest Washington actually did anything wrong as a result. Things get more entertaining when you tighten the tinfoil hat and dig a little deeper into the kind of territory the Assassin's Creed series loves best: the point where history, conspiracy and fiction meet. See, Washington was a Mason. There's some who believe that the Masons and another secret order, the Illuminati, are in cahoots, but there are others—backed up by a quote from Washington himself, who describes their efforts as "diabolical"—who believed they were in open conflict. The Illuminati Washington is rumoured to have referenced is, of course, not the same thing we associate with the word now. Back in the 18th century, it was an organised and known group, operating out of Germany, until it was shut down by both political and religious bodies for being treasonous and heretical. While being similar in structure to the Freemasons—indeed, many of its earlier members drew from both groups—the Illuminati were made up of more radical thinkers who more openly toyed with the idea of things like a "new world order", which is just the kind of thinking that gets a group outlawed by strict German authorities. It's into this dovetailing of history, myth and fiction that Robert Shea and Robert Anton Wilson's The Illuminatus! Trilogy got even wackier than Ubisoft's "Washington as Napoleon" premise. In their tale, Adam Weishaupt—the founder of the Illuminati—kills his Masonic enemy George Washington and takes his place as President. Whether Ubisoft took this kind of madness as their inspiration for the new DLC or whether they just wanted to revel in the historical fantasy of turning a "good" buy "bad", it doesn't matter; as a sucker for alternate histories I can't wait to get my hands on it. I mean, when you look at the historical precedence for guys like Washington, it's grim reading. From Caesar to Napoleon, when a military commander also gets his hands on the government, the lure of absolute power usually proves too great to resist. For Washington to have done the right thing, and still end up as a villain in not one but two major pieces of entertainment, may seem a little unfair, but then, you can always balance it out by playing a little Day of the Tentacle.